Have you ever seen people make lists of things they are thankful for during the entire month of November? Usually I participate in the 30 days of Thankfulness and put one every day as a status on Facebook. It dawned on me last year that my students could really benefit from this. Many of them have so many things to be thankful for but do not realize it. 2018 dates have been added! 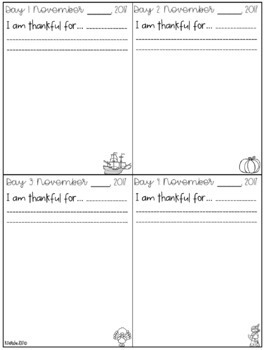 Every day, students write the date, the thing/person they are thankful for, and draw a picture. At the end of the month, each student has a book of things they are thankful for to share with their family at Thanksgiving just like the pilgrims did at the first Thanksgiving!